This month we interviewed Gabbie, a new Summer volunteer. A rising high school senior, Gabbie pursues an interest in photography when she's not volunteering at ArtQuest. Below we share a few of Gabbie's thoughts regarding her time as an ArtQuest volunteer. What makes you look forward to volunteering at ArtQuest every day? "I love interacting with all of the families and kids. Being around both the gallery's art and the kid's art is a fun part of the experience. And sometimes when ArtQuest isn't terribly busy you can craft alongside the kids and I really enjoy that." What is a regular day like for an ArtQuest volunteer? "I mostly assist with the kids' needs and help them out if they need something particular. Artistically, I guide them when they ask for assistance, but ArtQuest is largely a free environment. I usually work during Open Studio hours or Family Nights. Family Nights are a rewarding experience because I get to watch parents make art alongside their kids." To you, what does it mean to be an ArtQuest volunteer? "To me, it means to be there for other people, to be creative, and to be helpful all in an artistic environment." Do you have any favorite memories since you started volunteering at ArtQuest? "I just started volunteering last week, but my first day was a really busy Family Night. The woman that was overseeing Family Night, Sam, encouraged me to interact with the kids and I got to make a really good connection with some of the children. There was one kid, named Alex, that I met my first night, and when I saw him again he remembered my name and was excited to show me his artwork, getting my attention with 'Gabbie! Gabbie! Look at this!' and that was a special moment for me." Do you find that the children who visit ArtQuest often form this special bond with a volunteer? "Definitely! It's one of the things that drew me to ArtQuest in the first place." Do you have any artistic aspirations? "I actually used to come here a lot when I was a kid myself and I loved it. Naturally, ArtQuest was a place where I would want to volunteer. As I've grown up, I'm very interested in photography and I hope to build upon that in the future. 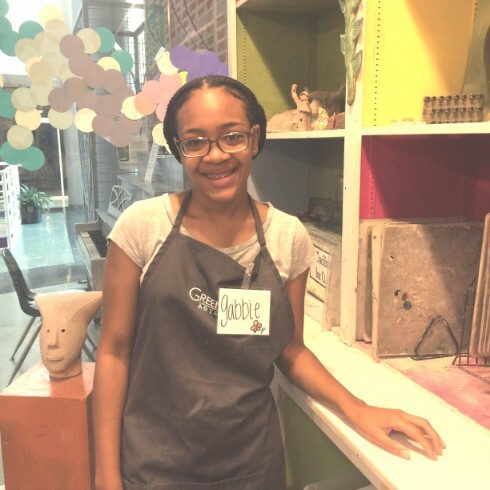 The kids here are so creative and I definitely find inspiration in the ArtQuest space."